Timesaving – The process of posting and confirming sub requests is done within seconds. Easy to use – A training video is included. The whole substitution process is done within a few mouse clicks. Incentive Mechanism – The credit/debit system incorporated in the GetSub provides student workers with incentive to sub others. * Save time- convenient- easy to use: 1 log-in, 3 mouse clicks…done! Traditional: Students who need a sub fill out a slip of paper and post it in the kitchen area of dining hall. Students have to physically be there to either ask for a sub or sign the slip to cover someone’s shift. This lowers the likelihood of a sub request being accepted by a fellow student worker. In most cases, when nobody accepts that sub request, the student asking for the sub doesn’t show up for work, which means that s/he gets marked absent and other students have to do extra work. With GETSUB: Student workers can post or accept a sub request in their dorms, at computer labs, or anywhere with internet access. All can be done within a matter of seconds! Students posting or accepting a sub request need only to log into the System and click their mouse 3 times. College students spend substantial amounts of time on computers. This program will increase the possibility of a sub request being accepted, as it’s easier for students to accept it. Traditional: A student may not feel like subbing for someone while s/he is checking emails, and s/he deletes the message. However, as it often times happens, s/he might change their mind but the email message is already deleted and s/he doesn't know if there are some more sub opportunities. In this case, s/he will likely give up the idea of subbing. With GETSUB: Students looking for subs can post a request from their dorm making it easier fo students to look for a sub if they are not able to show up for work. It takes only seconds for students who want to work extra shifts to log into the system and see all the available sub requests and the ones already taken. Whenever they decide to accept a request, they simply click the button and everything is taken care of. This online system is available 24/7 and all the sub requests are organized into a clearly defined and easily monitored spreadsheet. Traditional: For supervisors, it’s hard to know beforehand who will sub whom when a sub agreement is made via email, the most popular way subs are found. With GETSUB: Supervisors will have real-time information of their employee’s schedule changes. Supervisors need only to log into the system, to instantly know who will be at every position. With this updated knowledge the supervisor can make necessary arrangements to accommodate the situation long before the shift even starts. Traditional: Every time a student subs for a fellow worker, a supervisor has to manually modify the schedule to reflect the change. The supervisor also needs to serve as a witness of the sub agreement. With GETSUB: All worker and sub changes are automatically updated and recorded in real-time. Supervisors don’t need to anything if there’s a worker change due to a sub. All the information is in a database, just a few clicks away. Most importantly, the sub record will serve as the witness to verify who subs whom, and it’s 100% accurate without memory blur problems. If a supervisor happens to be in a situation when it’s impossible to check the paper records, he can simply log onto the internet and s/he will quickly have the most up-to-date records. Traditional: There’s no organized record of sub history in dining halls. It has no record of who has subbed the most. How does the GetSub System make everyone on campus better off? USE GetSub NOW! Students who need subs will spend much less time requesting a sub and will find a sub easier. Students who want to pick up extra shifts will spend much less time finding sub opportunities. Supervisors will save a significant amount of time managing and coordinating student shifts and spend less time in figuring out who is working what shift. Students at large will be benefited due to the lightened burden on the campus email server and in the long run benefited from the more money raised through phonathon callers for the Pioneer Fund. Reading through daily email sub requests technically would cost one person approximately 30 minutes. Suppose there are 30 people who received the email, that’s 900 minutes for one day. 5 days a week would total to 4,500 minutes a week which means 18,000 minutes a month or 300 hours a month! And 1,200 hours a semester! If you believe time is money, and take into account that one hour’s average wage of working on campus is $7.4, that is a total of $7,880 per semester. GetSub can reduce the time for the whole process to a matter of seconds for everybody involved! GetSub can save everybody a huge amount of time. It matches the sub requesters and “subbers” in a more efficient way, and increasing the sub acceptance rate. 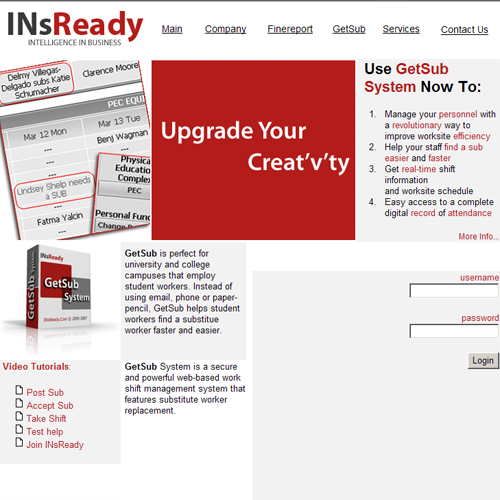 If the students working in your department experience any of the similar sub problems, please contact INsReady now. We will work to provide you with specific solutions according to your needs. 2. Click "My Schedule" on the left panel. 3. Click the name of the shift that you want to request a temporary sub for. 4. Make sure you select the correct shift and then enter your password to confirm. Meanwhile, you can write your personal message in the textbox that will be sent to all of your co-workers. This is OPTIONAL. 1. Go to "My Schedule". The shift you have posted a sub request will show up as a red clickable link saying "Sub Posted: Click here to cancel". 2. Click this link to cancel. 4. You will see "Success" meaning the sub request has been canceled. 1. Log in and you will see a shortcut list of Sub Requests on the Home Page. 2. You can click any of the shifts in this shortcut list that include all the available shifts you can sub for. 3. Enter your password to confirm and it's optional to type your message the textbox. 4. You will see the "Success" sign and that signifies you have accepted this sub request and need to mark your calendar to show up for work! 5. The person who requested the sub will receive an email notification informing your acceptance of his or her sub request. 2. On the left panel, click the name of your workplace for the General Schedule, e.g., if you work at PEC, click PEC; if Phonathon, click Caller under the "Phonathon" tab. 3. The shift in red saying "Someone needs a sub" means this shift is available for substitution. 4. To accept, click the link "Someone needs a sub" in red. 5. Enter your password and it's optional to type your message the textbox. 4. You will see the "Success" sign and that means you have already accepted this sub request and you need to mark your calendar to show up for some extra bucks! 2.On the left panel, click the name of your workplace for the General Schedule, e.g., if you work at Dining Service, click Campus Center under Dining Services; if PEC, click PEC; if Phonathon, click Caller under the "Phonathon" tab. 3. Once you see the general schedule of your workplace, you can take any shift that shows up as "Open" in a red clickable link. 4. To take this shift, just click the red "Open" link. 6. You will see "Success" if you have successfully taken this shift. Your supervisor will be notified of your taking this shift.